First introduced in 1887, the venerable Webley was in use by British forces through 1963, and can still be found in limited service throughout the old British Empire, but it gained its greatest fame as Indy's revolver in the "indiana Jones" movies. 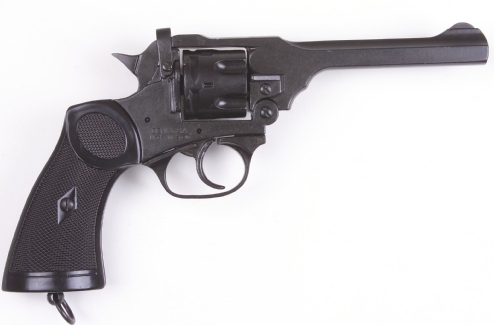 The Webley went through numerous different marks during its long production run. First offered with chambering for a .455 cartridge, it was updated in 1932 to fire .38 S&W 200s, amd saw heavy use during World War II. Our non-firing replica is a detailed reproduction of the 1932 Mk IV, completely metal except for the composite grips. This replica breaks open like the original, the cylinder rotates and the double-action trigger and hammer both work. 10-1/4" long overall with a 5" barrel. 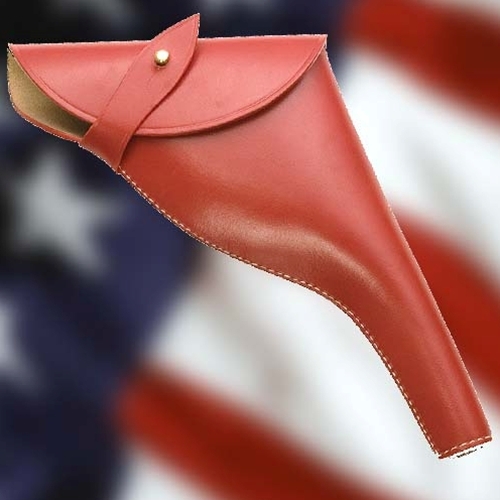 #802197 - The perfect accessory to complement your Webley replica, this top-grained leather holster is reproduced from those worn by Commonwealth forces in both WWI and WWI. It fits the leather or web garrison belt. Great costume addition for reenactors! Used by Commonwealth forces in both World Wars.